It’s Spring and we are in love with pastels! Slip on Lilyrae boasting a layered hem that floats to your elegant gait. Its lightweight chiffon gathers gently when pinched with a bold, detachable obi belt that loops around the waist and knots into a dainty ribbon. Soft to the touch with a full non-sheer inner lining, a cross-back twisted shoulder strap is playfully youthful. Available in sizes S and M.
Kashmiri is a gorgeous Indian embroidery art form with motifs bearing creepers, leaves, and florals intricately woven from a single running thread. 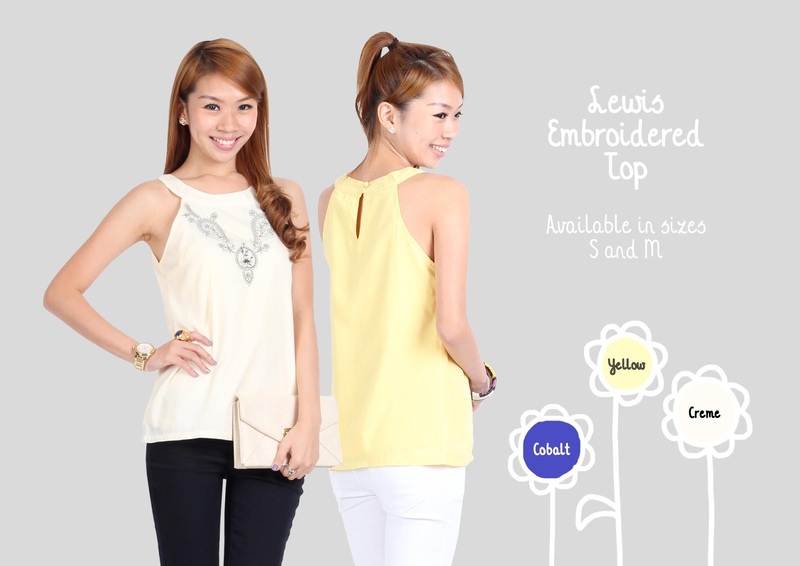 Lewis is a modern twist to this classic, with a stunning embroidered chest piece. Made of fully-lined, non-sheer polyester, the round-neck collar and steep armhole slits are designed to accentuate collarbones and slim arms. Psst: we’re loving the keyhole collar closure too! Available in sizes S and M.
Ahoy, let’s set sail! Reminiscent of retro 3D art, Elle Moss showcases an embroidered collar weave along a boat neck cut. The centerpiece is a whimsical interpretation of a nautical knot that is equal parts fun and cutesy. Made of crepe that is softly pleated to band at the waist, the romper closes with a back zip and keyhole button. Available in sizes S, M and L.
We know your social calendar is lined up with glamorous parties and joyous weddings. Coupled with your trusty heels and some statement jewelry, Risque is just the dress you need. With chiffon artfully pressed into multidirectional pleats, an m-shape bustier (complete with an inner anti-slip strip) and banded waist brings out your feminine curves. A slight pompous flare flows from the waist while a concealed back zipper allows for easy wearing. 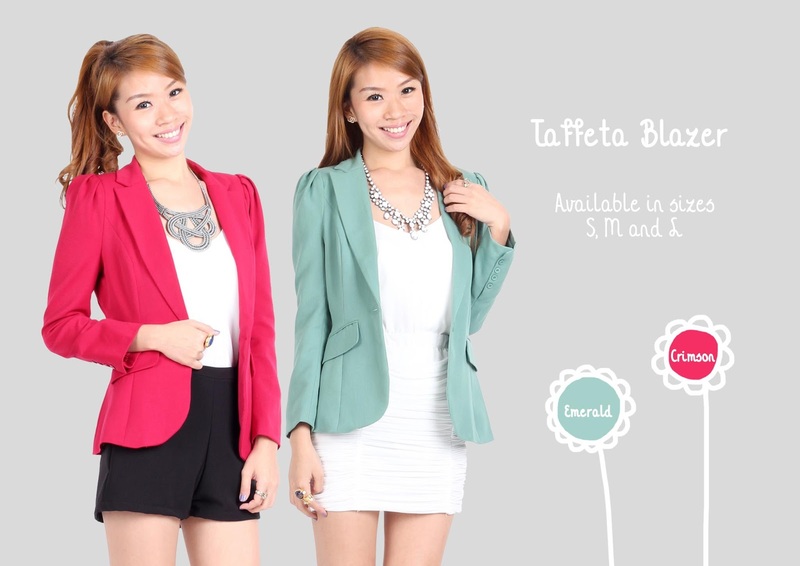 Available in sizes S and M.
We’re bringing you the best of blazer fashion once more! With its linen fabric finely pleated at the shoulder bone for a puffy look and some light shoulder padding, Taffeta is a merry reinvention of the ol’ power blazer. A single button closer pulls the blazer in to fit firmly at the waist with a slight peplum flare, while small cuts along the lapels make for a subtle edgy chic. Available in sizes S and M.
Fancy some fuss-free fashion? Casually slip into the Parc Pixie one-piece dress on lazy mornings with a convenient side zipper. Its chiffon-crepe combination is smooth, lightweight, and perfect for the tropics. Coloured piping runs along the armhole and collar with a matching band lining the shorter hem. Grab some strappy sandals and sunnies, and you’re all set for the weekend. Available in sizes S and M.
Posh is the word. With wide shoulder straps melding into a deep v-neck cut, La Belle’s delectable coupling of soft chiffon and a lace overlay is a stunner. A detachable metallic tie sash fits perfectly over a thin elastic band at the waist and provides a nice contrast to the matt floral and leaflet motifs set against the fully-lined frock. One size fits all.